Alimuddin Usmani Interviews Gilad Atzmon - we spoke about Dieudonné, the 'socialist' , The Zionification of the Left, Oikophobia, the devastating impact of the Frankfurt Yeshiva and the 68 revolution, Bernard-Henri Lévy, Shoa & Humour, the Jewish Question and more..
Alimuddin Usmani: Joe le Corbeau is a French cartoonist. He is a friend of Dieudonné and often makes a mockery of Zionist figures like BHL, 'the Holocaust religion' and the New World Order. On January 28, he was arrested by the police for having posted on his website a picture of someone performing the quenelle salute in front of a Jewish school. Joe le Corbeau has been accused of incitement to ethnic or racial hatred. Dozens of mainstream media outlets published the same quenelle without having any problem. In your opinion, is Joe le Corbeau subject to tribal revenge via the French judiciary? Gilad Atzmon: Once again, we learn that neither the French ‘Socialist’ government nor its Jerusalemite paymasters can cope with a certain type of parody. Is it a coincidence? For generations, Yiddish humor has been outrageously mocking the goyim’s alleged ‘naivety’ and ‘stupidity’ while simultaneously celebrating an imaginary ‘Jewish wit’. But as we learn, once again, ‘mocking others’ is a Jews-only territory. At least the French ‘Socialist’ government has been kind enough to let us know what Jewish chosenness actually means in practice. But it goes even further. In the past, the Left was concerned with the rise of xenophobia – animosity towards the stranger, the foreigner, the ‘Other’. But what we see in contemporary France is the complete opposite, namely Oikophobia –­ an emerging hatred and fear of the Oikos, i.e. the home, the indigenous, the host, the rooted, the authentic. In order to combat xenophobia, the New Left, dominated by Frankfurt Yeshiva graduates, introduced us to identity politics – a manifest attempt to break society up into multiple marginal sectors. The outcome was a swift metamorphosis of Left culture. Traditional working class politics was replaced by a fake notion of diversity that was translated, in practice, into a manifold of meaningless sectarian clashes. Threatened by nationalism and patriotism, the Jewish intelligensia wanted to see society broken up into manifold discourses driven by ethnicity, race and gender (e.g. LGBT). It basically re-defined the Western ethos as a collective of godless synagogues. The post-'68 Left joined this very dangerous political experiment in a desperate attempt to break down the overtly cohesive, nationalist working class. As we all know, the consequences have been devastating. Instead of overcoming xenophobia, racism or intolerance, each of us has become a stranger in our own home. We voluntarily Other-ised ourselves to the point of oblivion. This is exactly where Dieudonné intervenes. By means of humour, he has managed to re-unite us all: the Black, the Arab, the White, the poet and the patriot. He has reminded us all what is really meant by resistance. Dieudonné has managed to re-launch a genuine Left dialectic dynamic fuelled by negation. Once again, we are united by our oppressors. And they can be easily identified – the forceful and domineering Jewish Lobby and its ‘Socialist’ puppet government. Joe le Corbeau is also opposed to Oikophobia – his humour is an emblem of the Oikos, i.e. the home, the nation, the rooted, the authentic, Frenchness. I guess that a half-century of Frankfurt School indoctrination is about to come to an end. Alimuddin Usmani: Joe le Corbeau is the publisher of 'Shoah Hebdo', a parody of the satirical publication 'Charlie Hebdo' which often targets Catholicism and Islam. Since Charlie Hebdo is regularly supported by the French government, does Joe Le Corbeau's work help us to become aware of the double standard concerning blasphemy? Gilad Atzmon: It is far from a coincidence that the only people who still touch upon truth within Western society are comedians and satirists. Politics, media, academia and the Arts have long since been castrated by means of political correctness. Satire is certainly the last frontier, and it explains very well why the French Jewish elite unleashed its Socialist Big Brother to impose the current Orwellian Newspeak measures in a desperate attempt to remove le Corbeau, Dieudonné and others from our public milieu. But, so far, their desperate campaign has backfired. They have made Dieudonné into an international hero. Gilad Atzmon: At the time, I published many of the cartoons on my site. I think that the contest delivered an astute message. It juxtaposed the Jewish Holocaust and the Palestinian one. It ridiculed the Holocaust denial laws – absurd European legislation that is set to prevent us revisiting and revising our past. But it also mocked the Holocaust religion – a banal concept fuelled by an amalgam of tribal vengeance and Judeo-centric victimhood. But most importantly, let me tell you, I grew up in Israel in a society that was deeply embarrassed by the Holocaust and repelled its survivors (read Tom Segev’s "The Seventh Million"). The Holocaust jokes I heard in Tel Aviv were far more vile and cruel than anything I’ve ever seen in the Iranian contest or anywhere else. Alimuddin Usmani: Following its neighbor Spain's lead, Portugal is planning to grant citizenship to descendants of Sephardic Jews expelled in the 15th century. What is your reaction to this news? Gilad Atzmon: I think that it is quite brilliant. All we need now is to make sure that the Khazars take back the Ashkenazi Jews. This would be the final and most peaceful solution to the Jewish question. Alimuddin Usmani: On February 9th, Bernard-Henri Lévy traveled to Kiev to support the Ukrainian opposition. Among the opposition, we find the Svoboda Party, a National Socialist Party using neo-Nazi symbols. In your opinion, is it a simple coincidence that BHL is on the same side as these people? 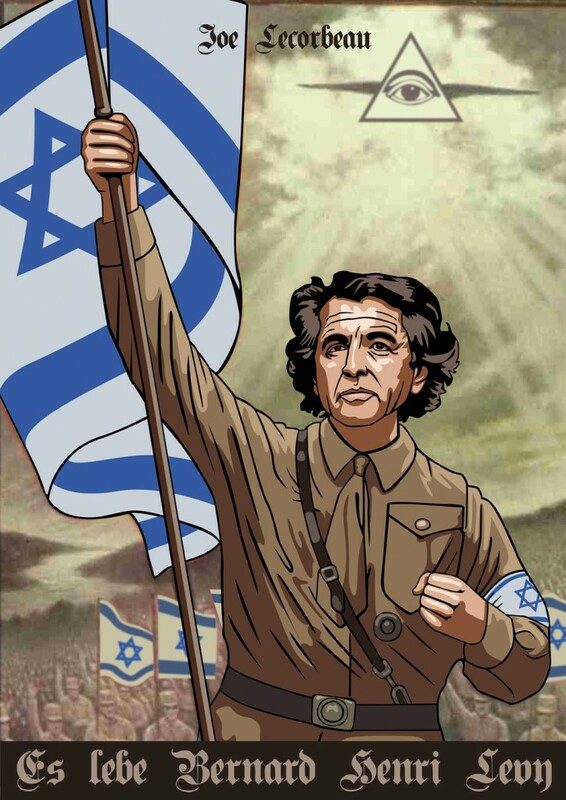 Gilad Atzmon: It has become an established fact that Bernard-Henri Lévy has developed a unique interventionist mental affection. This peculiar morbid state of mind is indeed symptomatic of Zionists who for more than two decades have been launching and winning proxy wars (against Iraq, Iran, Syria, Libya, and now Ukraine). However, the fact that BHL may eventually bond with a neo-Nazi party is actually a positive development. It only means that BHL has, at last, found his true intellectual and ideological roots. After all, Zionism is a racially-driven nationalist and expansionist concept. It is inherently Nazi-like. I am looking forward to see what kind of a deal BHL may strike with Svoboda. After all, the Holodomor – the systematic starvation of millions of Ukrainians, is by far the most horrid crime of the 20th century. The Jewish lobbies around the world have been investing a lot of energy and political effort attempting to conceal the role of Bolshevik Jews in this genocide. Alimuddin Usmani: On March 20, you're giving a talk in Geneva. Can you tell us something about the content of this event? Gilad Atzmon: I will be talking about "Truth and Concealment". By contrasting Athens and Jerusalem, I will examine the devastating continuum between the Chosen and the progressive, between Israel, Zionism and the New Left. I am basically going to explain, once and for all, why nothing good has happened in Palestine, Paris or Detroit for quite some time. I will suggest that, as things stand, we are all Palestinians; and that we had better unite and start to move on again.